A quality handset with serious security chops, but will it be overlooked? Hours before Silent Circle's Blackphone 2 broke cover, the mobile phone company formerly known as Research In Motion unveiled its first Android-based smartphone, Priv. By moving towards Android, BlackBerry cemented the belief that the platform is now ripe to be used as an enterprise-class, secure platform. Was this purely coincidental? Maybe. But what it does is legitimise, to some extent, the work carried out by companies such as Silent Circle, Boeing or Granite, all of which have developed Android-based smartphones for businesses and individuals looking for more secure devices. Silent Circle's original Blackphone was released last year in a joint venture between Spanish manufacturer GeeksPhone and Silent Circle. Since then, the latter bought its hardware partner out of the joint venture, a move which came as Silent Circle revealed it raised $50 million (about £33 million, or AU$70 million) to fuel its expansion. The new iteration, called the Blackphone 2, just launched for $799 (about £530, or AU$1,140) and brings in some noteworthy improvements to its predecessor. The phone runs on mid-range hardware with some additional security components to keep your data private and the phone itself untouched. We've been told that there's a physical fuse that blows should someone other than the owner want to modify the smartphone's firmware. BlackPhone 2 uses AES-128 encryption to keep your data secure from the moment it's switched on, and promises to provide the world's fastest vulnerability management. Critical vulnerabilities, the company says, will be patched within 72 hours of detection or reporting with updates coming directly from Silent Circle, not from the carriers or Google. As expected, the phone is almost entirely anthracite in colour and sports a glossy finish with a glass facia at the rear and the front, both of which do a great job of keeping the owner's fingerprints in plain sight (we're not sure whether that is a privacy risk). Its slightly curved corners and textured edges don't make it any easier to hold though – its large 5.5-inch Gorilla Glass display means that its size might be an issue for those with smaller hands. With a full HD resolution (that's 1920 x 1080 pixels, the same as the iPhone 6 Plus and 6S Plus), it rivals what high-end business laptops usually offer, albeit on a larger screen. The display is bright and quality-wise it's on par with other efforts at the high-end of the smartphone market. Open the phone (we obviously didn't do that) and you'll find an 8-core Qualcomm Snapdragon 615 processor clocked at 1.7GHz. There's also 3GB of RAM, 32GB internal storage, a microSD card slot that can store up to 128GB (just make sure you don't store any vital information on it), a 13-megapixel rear camera at the back and a 5-megapixel snapper in front. A 3060mAh battery (with Quick Charge 2.0) keeps the whole thing ticking; the longevity of the handset will, as one expects, vary according to how the phone is used. As for Wi-Fi, the Blackphone 2 offers a Smarter Wi-Fi service (the handset has 802.11ac) that stops broadcasting your details to an open hotspot after a short period of time. One obvious missing feature is a fingerprint reader for those who prefer biometrics-based security solutions but Silent Circle told us that they didn't find it compelling to include one at this stage. 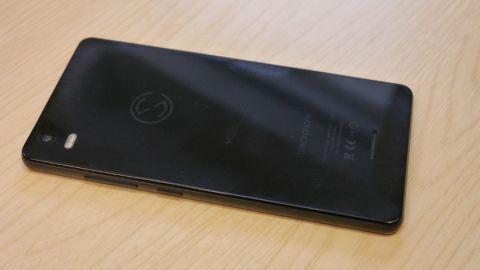 The Blackphone 2 runs Silent OS, a modified version of Android 5.1.1 Lollipop, which boasts Google's services including the Play app store, which might seem to be slightly odd given the recent spate of vulnerabilities that have hit apps within Google Play, and the tendency of free mobile apps to siphon as much personal data as possible in order to serve more relevant ads. But you have granular control on each application's permissions, something that Google has introduced in Marshmallow, otherwise known as Android 6.0. Whether users will wholeheartedly embrace that concept or just ignore it because it requires tinkering with the setting remains to be seen. Blackphone 2 also offers the ability to segregate your applications, separating your work life and your personal life. You could potentially have other so-called 'spaces' (up to four of them) which act like virtual machines or silos. These can be populated with anything you'd expect to find on a smartphone (apps, files, photos and so on) and can be pushed to the target handset by the IT department like a shrink-wrapped package ready to use. Silent Circle also includes a Silent App store which it says will be populated with apps carefully vetted by the SC team via a semi-automated process. Needless to say, only a tiny fraction of the hundreds of thousands of apps on Google Play will ever make it to that proprietary store. At the core of Blackphone's security features is the Silent Suite of applications which encrypts calls, texts and data on the phone, and is sold as a subscription. Note that you will need a separate data plan to get the whole thing working as the feature runs as a VoIP service, handled by Silent Circle's ultra-secure infrastructure located, as you might have guessed, in Switzerland. Subscriptions start from $12.95 (around £8.50, or AU$19) per month for 100 Silent World Minutes to $39.95 (around £25, or AU$55) for 1000 minutes to 120 destinations. You will also need to have a Blackphone on both sides for the communication to be entirely private. The Blackphone 2 is a sleek, attractive handset with a premium feel, and it's a phone that Silent Circle says has been designed from the ground up to be private. However, its price is likely to be a massive stumbling block; don't expect them to sell like hot cakes. The company made it clear though that while individuals might be a significant portion of its end-users, the biggest market will be enterprises and organisations where there is a demand for secure Android devices that don't look rubbish. That is why the product ships in two boxes – one bland outer shell for the IT department or value added reseller to open, and a black one that houses the smartphone once it has been configured for its final end-user. For those that this handset targets, the fact that it doesn't yet have government and military certification such as FIPS 140-2 makes it more of a challenge. It does however integrate with the more popular MDM systems (SOTI, Blackberry's Good and Citrix) and Android for Work. Looking ahead to the next 12 months, the biggest threat will come from BlackBerry who will now fully commit to Android, allowing its customers to get the best of both worlds. Then there's also the fact that Google has included a number of these features as part of its Android for Work scheme, available on Lollipop and Marshmallow. This makes Android as a whole a more resilient, enterprise-ready platform, but also opens the market up for other potential competitors that have a more established business user base.